Trials have shown that following the MIND diet could cut your risk of dementia by as much as 53%. 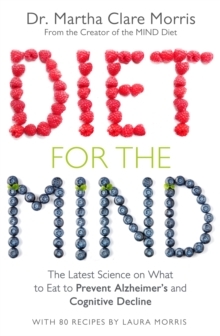 In Diet for the MIND, Dr Martha Clare Morris, lead creator of the MIND diet, presents the foods with the most compelling scientific evidence for prevention of cognitive decline. Emphasizing whole grains, leafy greens, lean proteins, beans, and vegetables, and also flagging the foods you should avoid, Diet for the MIND reveals the groundbreaking nutritional science behind the diet and includes dozens of recipes to help you follow it.